Adrenal gland, Cortex - Amyloid in a male B6C3F1/N mouse from a chronic study. 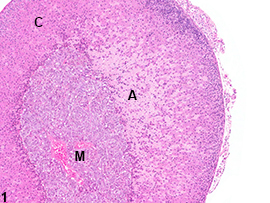 There is homogeneous, amorphous, pale eosinophilic material (amyloid, A) expanding the zona fasciculata and zona reticularis; C = cortex, M = medulla. Adrenal gland, Cortex - Amyloid in a male B6C3F1/N mouse from a chronic study (higher magnification of Figure 1). 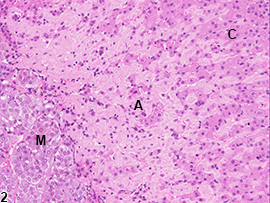 The homogeneous, amorphous, pale eosinophilic material (amyloid, A) in the zona fasciculata and zona reticularis separates and replaces the cortical cells; C = cortex, M = medulla. Adrenal gland, Cortex - Amyloid in a male Swiss Webster mouse from a chronic study. 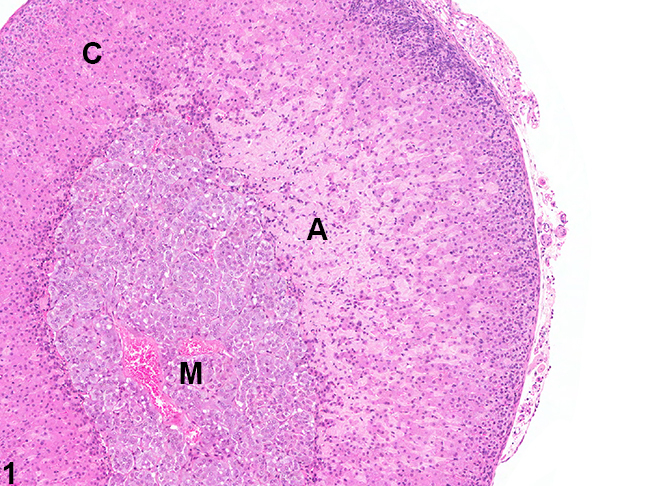 A thick circumferential band of homogeneous, amorphous, pale eosinophilic material (amyloid, A) largely replaces the cells of the zona reticularis; C = cortex, M = medulla. Adrenal gland, Cortex - Amyloid in a female B6C3F1/N mouse from a chronic study. Abundant, homogeneous, amorphous, pale eosinophilic material (amyloid, A) separates and replaces the cells inner cortex; C = cortex, M = medulla. 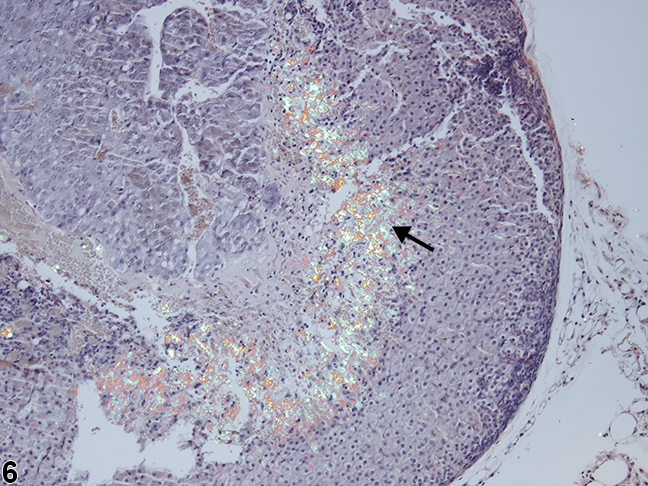 Adrenal gland, Cortex - Amyloid in a female B6C3F1/N mouse from a chronic study (same animal as in Figure 4). 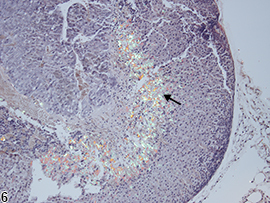 Amyloid deposits in the inner cortex (arrow) stained with Congo red appear dull reddish orange under nonpolarized light. Adrenal gland, Cortex - Amyloid in a female B6C3F1/N mouse from a chronic study (same animal as in Figure 4). Amyloid deposits in the inner cortex (arrow) stained with Congo red have a characteristic �apple green� birefringence under polarized light. The term "amyloid" classically denotes various insoluble, fibrillar proteins that share a similar configuration (β-pleated sheets). These abnormally folded proteins form and accumulate intra- and extracellularly in many tissues due to many causes, such as genetic predisposition and local and systemic inflammation of various etiologies. In rats, focal or generalized amyloid deposition rarely occurs in any tissue, including the adrenal gland. In mice, amyloid deposition in the adrenal gland and other tissues is overall far more common. There are genetically related differences in incidence, with very low incidences in some strains, such as the B6C3F1/N mouse, and much higher incidences in other strains, such as (Swiss) CD-1 and Swiss Webster mice. In mice, amyloidosis is usually a spontaneous, age-related systemic disease, with the adrenal gland one of the more commonly affected tissues. Severity (amount of amyloid/tissue) also tends to increase with age in all tissues, including the adrenal gland. 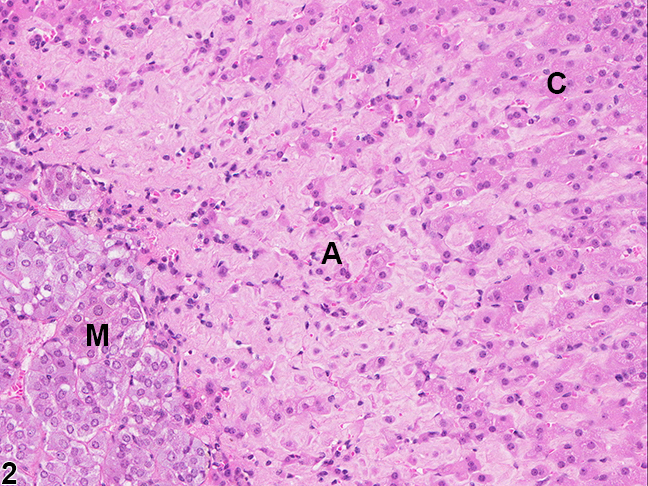 In mice, adrenal amyloid deposition usually first appears as small clumps between cells of the inner cortex, with progressive centripetal extension into the outer cortex (zona fasciculata) ( Figure 1 , Figure 2 , Figure 3 , Figure 4 , Figure 5 , and Figure 6 ). The amyloid proteins can form large, expansile aggregates ( Figure 1 and Figure 2 ), which distort the normal architecture and can eventually coalesce into thick circumferential bands that surround the medulla ( Figure 3 and Figure 4 ). 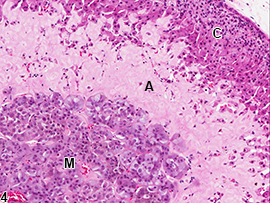 The amyloid may extend into the medulla or zona glomerulosa, but these regions are generally unaffected. 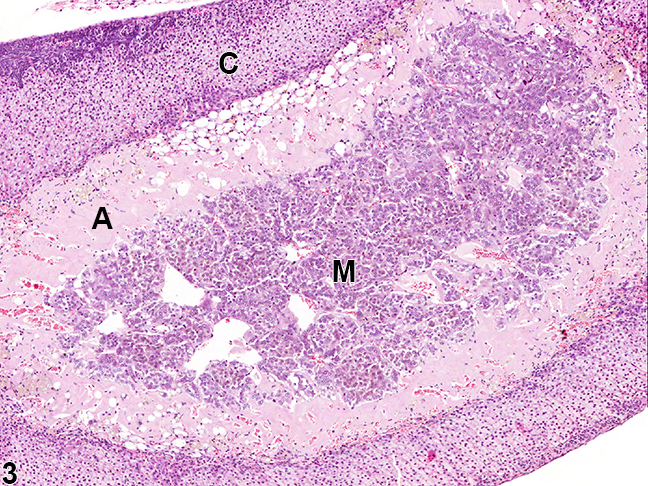 With hematoxylin and eosin (H&E) stain, amyloid deposits appear as homogeneous, amorphous, pale eosinophilic material ( Figure 1 , Figure 2 , Figure 3 , and Figure 4 ). Special histochemical stains are often used to distinguish amyloid from fibrous connective tissue, fibrin, and other substances. One of the most widely used stains is Congo red. Amyloid stained with Congo red appears pale to dull red under nonpolarized light ( Figure 5 ) but exhibits brilliant birefringence (usually "apple green") under polarized light ( Figure 6 ). Other methods for amyloid detection include fluorescent or metachromatic stains and immunohistochemistry. Amyloid in the adrenal should be diagnosed as present without assignment of a severity grade. Any associated loss or degeneration of cells should not be diagnosed separately but should be described in the pathology narrative. Whether the adrenal amyloid deposits are localized or part of a systemic distribution should also be addressed in the narrative. If amyloid is seen in both adrenal glands, the modifier "bilateral" should be added to the diagnosis (lesions are assumed to be unilateral unless otherwise indicated). Brayton CF, Treuting PM, Ward JM. 2012. Pathobiology of aging mice and GEM: Background strains and experimental design. Vet Pathol 49:85-105. Elghetany MT, Saleem A. 1988. Methods for staining amyloid in tissues: A review. Stain Technol 63:201-212. Howie AJ, Brewer DB, Howell D, Jones AP. 2008. Physical basis of colors seen in Congo red-stained amyloid in polarized light. Lab Invest 88:232-242. National Toxicology Program. 2010. NTP TR-558. Toxicology and Carcinogenesis Studies of 3,3',4,4'-Tetrachloroazobenzene (TCAB) [CAS No. 14047-09-7] in Harlan Sprague-Dawley Rats and B6C3F1 Mice (Gavage Studies). NTP, Research Triangle Park, NC. National Toxicology Program. 2012. NTP TR-576. Toxicology and Carcinogenesis Studies of Trimethylpropane Triacrylate (Technical Grade) (CAS No. 15625-89-5) in F344/N Rats and B6C3F1/N Mice (Dermal Studies). NTP, Research Triangle Park, NC. Sass B. 1983. 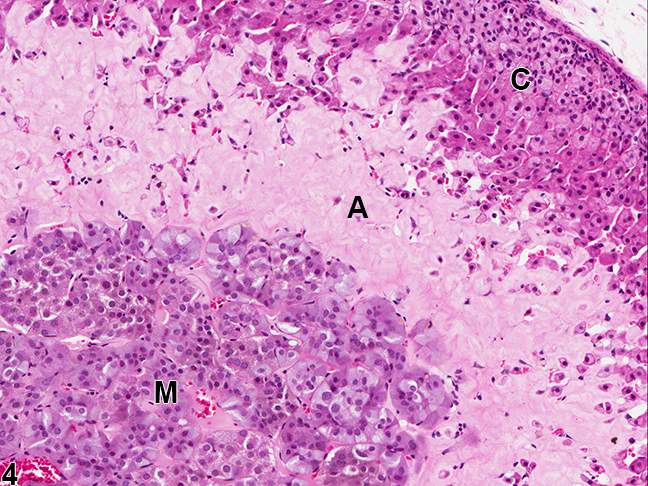 Amyloidosis, adrenal, mouse. In: Monographs on the Pathology of Laboratory Animals: Endocrine System (Jones TC, Mohr U, Hunt RD, eds). Springer, Berlin, 57-59. Yarrington JT. 1996. Adrenal cortex. In: Pathobiology of the Aging Mouse, Vol 1 (Mohr U, Dungworth DL, Capen CC, Carlton WW, Sundberg JP, Ward JM, eds). International Life Sciences Press, Washington, DC, 124-133.